It’s state law in Arkansas that you cannot smoke in restaurants or other public indoor places and I’m totally OK with that. 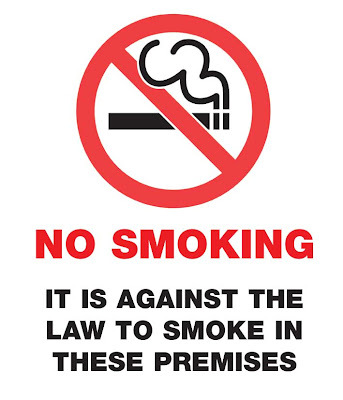 The law also states that you are not to smoke within 50 feet of an entrance to a building that is designated non-smoking, unless otherwise stated. I’m not sure about the laws and regulations for allowing smoke breaks in the work place so there is only so much I can say about the amount of time spent outside the entrance to our building at work with people puffing away less than 50 feet from my face. I never got into smoking, I tried, I failed, it’s probably better that way. I know people that are social smokers and only smoke when they drink, I know people that smoke all the time – that’s fine, whatever your choice is. However, I choose to be around those people when they smoke and I know they are all very courteous in their smoking and everyone appreciates it! Amendment/Addition thanks to Kirby at GGI (find her here: http://goodgalsinc.blogspot.com/)! She left a comment that reminded me I had not finished my entire thought process here! That is one of the reasons MZ and I tend to hibernate in the winter and not go out. It’s fine to go out to the bar in the summer when all the doors are open and there’s some sort of ventilation but when everything is shut up in the winter, it’s no fun to come home and smell like lung cancer – I’m assuming the combination of heavy cigarette smoke, stale alcohol and crowds of people is what lung cancer smells like! But I have to come to work, I guess I could walk the mile around the building to not enter through where the smokers smoke, but I don’t think I should have to. I’m also curious as to why at 8 am they are already taking a “smoke break” from work? Then again at 10, lunch time, 1 and 3… it’s like clock work! That also brings up the constant battle of do people who don’t smoke get slighted because they don’t have a need to take a smoke break? Seriously, I’ve have meetings be held up because people were finishing a cigarette! Anyway you can clearly see how I feel about this. I don’t care what you do with your body, but it does seem to bother me that you do it on what is considered to be my time. I was so happy when Arkansas finally passed the law that you can’t smoke in bars!! I was so use to people not smoking when I was in college in Texas but when I’d come home and go out, ew! !